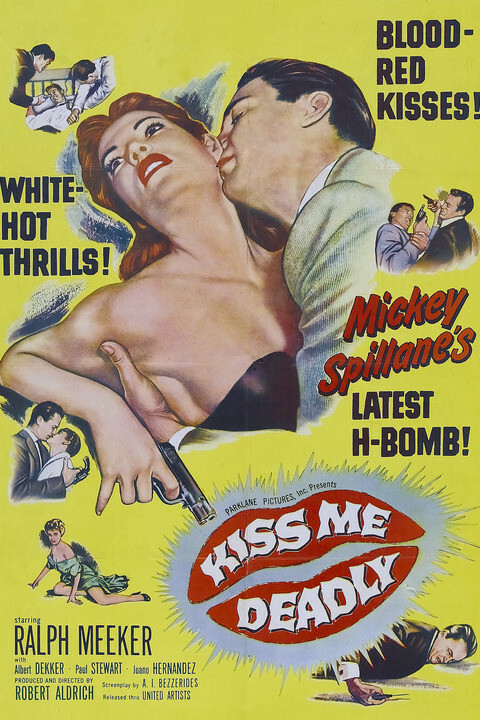 Kiss Me Deadly, original 1955 poster. Last week I had the chance to see Kiss Me Deadly on a big screen. 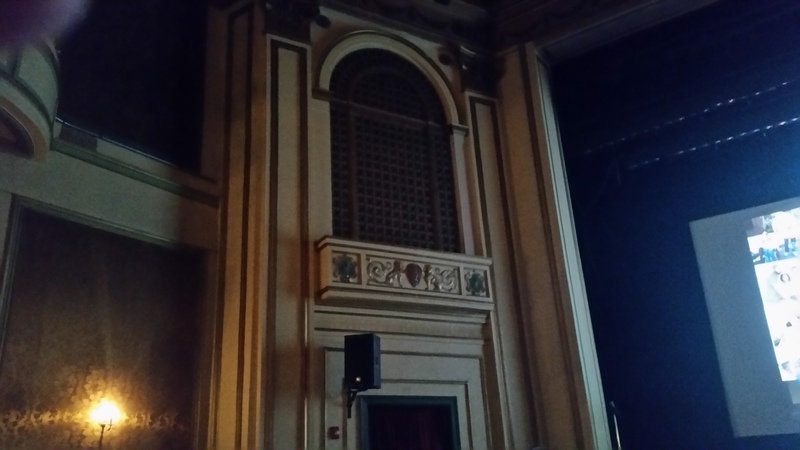 Our local art cinema house, Phoenixville’s Colonial Theater had the opportunity to show the classic film from a nice 35mm print. As always, the movie was introduced by one of the volunteers who told us a little big about the history of the movie. According to him, the director, Robert Aldrich, read the Mickey Spillane novel and though it had the potential to be a good film. The screenplay writer read the book and despised it. He felt the hero, private eye Mike Hammer, was made to be a thug in the book. So he decided to make him an even bigger thug in the movie version. Kiss Me Deadly begins with a woman running down the road wearing nothing but an overcoat, Mike Hammer (Ralph Meeker) runs into her while driving the same way in his sports car. She turns out to be an escaped mental patient who claims she was being held in the asylum against her will. Hammer believes her and offers to help the lady. All seems to be going fine until a band of crooks intercept him on the road and smacks Hammer in the head. He awakes hearing the woman under torture and plays possum. When the crooks stuff the body of the woman and Hammer in his car and run it over the cliff, Hammer survives by jumping out at the last minute. He survives and vows to find out who killed the woman and why. Balcony at the Colonial Theater. The movie is a wonderful trip down film noir road as it’s filmed in the dark alleys and cheap boarding housesof San Francisco . This is a San Francisco which looks run-down. It’s years before air conditioning and everyone smokes. All of the time. You see the way the city on the bay looked before it was taken over by hippies and computer executives. Robert Aldrich directed a grimy film and its easy to see why it wasn’t very successful in the 50’s. Kiss Me Deadly is one of those films which went on to influence French New Wave directors, Alex Roth, and every other film geek. The audience at the Colonial was respectful. It was a matinee show with plenty of older people in the audience. I didn’t see a lot of young people at this one. I like these classic matinee shows because the committee who selects the films can really pull-up some quality when they want to do it. Shoot, they’ve got Citizen Kane and Doctor Zhivago coming in the next few months. I’m still kicking myself for missing the original Casino Royale. And all on real film! Ralph Meeker plays the role of Mike Hammer very restrained. While the script may have called for a big dolt for the role, he was every bit the charming sophisticated and suave P.I. You only find out what how he makes his money, turning cheating spouses on each other, from the dialogue later in the film. This being a low-budget film from the time, you don’t see a lot of choreographed fight scenes or violence. Since computer generated imagery was in the future and the film is in glorious black and white, the special effects restrained. Best of all is the endless parade of character actors. Seeing all these memorable faces make the movie special, at least for me. There’s the great Jack Elam in an early role. Cloris Leachman has a bit part as the fleeing mental patient at the beginning of the movie. Paul Stewart as a mob boss couldn’t be more sinister. And we have Strother (“What we have here is a failure to communicate”) Martin playing the kind of role he was born to do: a sleazy punk living in a cheap room. It’s even got the great Charles Lane! The condition of the print could have been better, but these days I’m grateful for any presentation that uses genuine 35mm film. I talked to one of the presenters afterwards and he informed me the source was an archive, so this wasn’t some collector print bought off Ebay. You have to consider what decades of running a print through a projector can to the final film copy. Many of the low-budget films made over the decades never had their negatives stored, if they had one in the first place. Anymore I’m thrilled to see real scratches on film. The set pieces were excellent. Mike Hammer goes into a meeting with police detectives who tell him all they know about what he does for a living and he hardly says a word. The interview he does with a boxing coach focuses on them watching a new boxer, but you never see anything but their faces. There is a mousy morgue attendant who demands more and more bribe money until Mike breaks. And the box everyone is trying to fn: I won’t say what’s inside it but it glows and burns anyone who gets close. For years the print in circulation implied Armageddon happened at the end of the film. The one I saw was an intact print which allowed you to see the conclusion as intended. Kiss Me Deadly is a great film from the final days of Noir. 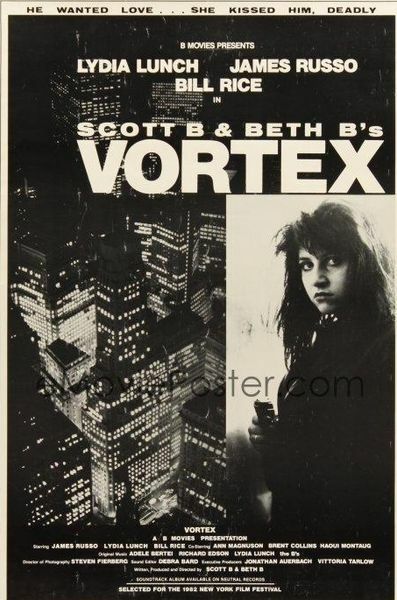 I’ve even seen the title ripped off to promote Vortex (“He wanted love…She kissed him deadly”) a New York City independent movie made in the 80’s. The current committee at the colonial is picking some great features and I wish I could see them all. The only better way to see this movie would be at an urban grindhouse, but those are long-gone.